This last weekend I decided to take a quick trip to San Diego to escape the Tucson heat (yes - it's STILL hot here...) and take in the San Diego Chargers home opener vs. the Chicago Bears! First stop - the WaveHouse! 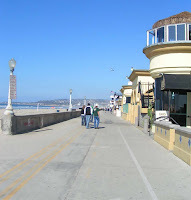 My favorite beach spot in San Diego - and Voted the Best Breakfast in San Diego in 2006! We decided it was a little too early for Bloody Mary's and settled for an awesome breakfast, while I caught up on all the things going on in Brit's active life, work and new house - some things I did not need to know! Then it was off for some roller-bladeing and watching as the beach and the neighborhood came to life! Mornings are by far my favorite times and I love wandering in different cities as the locals start their day and smells start to fill the streets as coffee, pastries and other goodies are being prepared. OK - Time to head to Qualcomm Stadium (still Jack Murphy Stadium for us long time Charger Fans) and see if we can find a tail-gate party to crash! I decided we should take the trolley to avoid the long lines to get in - as this game has been sold out for months! We left the car in Old Town and jumped on the Trolley and were surprised to see as many Chicago Orange Jerseys as there were Charger Blue! One of the great things about games in San Diego is that rival fans LOVE to travel to San Diego - not only is it a beautiful city - but the Charger Fans are some of the most hospitable and friendly in the league! Everyone was laughing, having a good time, wishing the other team good luck and just ready for a great game - with two great teams! Time to head to our seats! Brittany did not know it yet - but my favorite seats in the stadium, and where I always sit are in the Club Seats. They are halfway up the stadium, giving PERFECT views of the field from all angles, there are 4 private lounges with TV's for when you need a break from the heat AND they serve you in the seats - Stadium Heaven as far as I am concerned! The pre-game show was just getting started as we arrived, checked in with the neighbors - who luckily ran about 75% Charger Fans and 25% Bears Fans - and were surprised and amazed as 4 F-18's screamed across the sky just above the stadium as everyone erupted from their seats and the game began! I won't go through a play by play, but suffice it to say it was a defensive battle in the beginning with the Bears leading 3-0 at half time - but then the Charger Offense, lead by P. Rivers and LT ratcheted up the intensity in the second half with 14 points and the defense holding the Bears to ZERO - giving the Chargers a Season Opener winning score of 14-3! Go Chargers! Back at the WaveHouse! The WaveHouseis right on the Beach in Mission Beach, home of Belmont Park and one of the Oldest Wooden Roller Coasters in the US, originally built in 1925. While living in San Diego we always would bring visitors and friends here for a run on "Giant Dipper"! We got a great seat at the Bar and proceeded to watch the guys and gals as they surfed Bruticas Maximus - a 10 foot wall of water and one of the most incredible wave machines in the country! There were hundreds of people on the patio, in the restaurant and just standing around watching all the activity - it was a great way to end a great day! But all good things must come to an end - and I could see Brittany was starting to crash. :) Time to head for the airport, return the rental car and get our boarding passes. As usual, the flight was on-time and smooth as silk. We landed in Tucson, retrieved our cars and headed home for a good nights sleep! Great Day - thanks Brit! See you next time! GO CHARGERS - it's off to New England for my Chargers and a very tough game this Sunday.